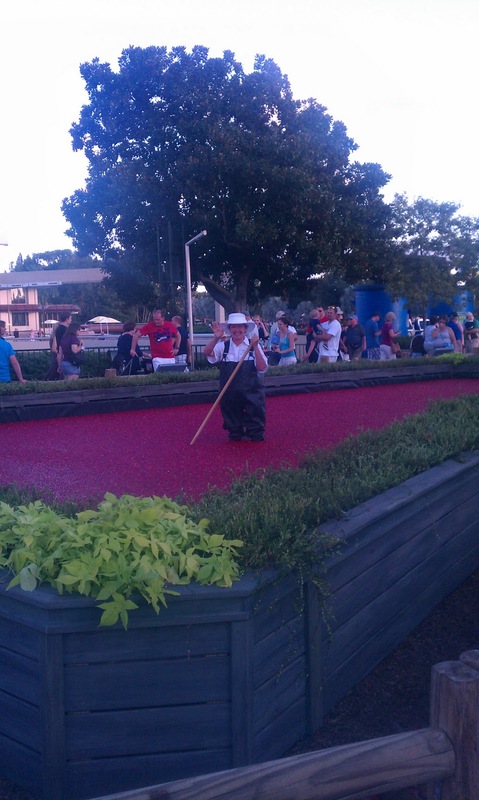 This week I went BACK to Walt Disney World’s Food and Wine Festival at Epcot for my second trip! Luckily I live in the area AND have my pass this year, so it’s reasonable to go there for dinner or a late lunch after a busy day! While trying not to hand over EVERY dollar I have to Disney, I did manage to get to try some more DELECIOUS things from this year’s festival. The Canadian Cheddar Cheese Soup – which was yummy! It actually had some kick to it, and even though it was still in the 80s out, it was well worth trying! You may need a water afterwards, or a drink! Parisian Cosmo Slush – which is apparently made from Ciroc Vodka, Grand Mariner, and Cranberry Juice. It was quite tasty, and a good follow up to the cheddar soup. 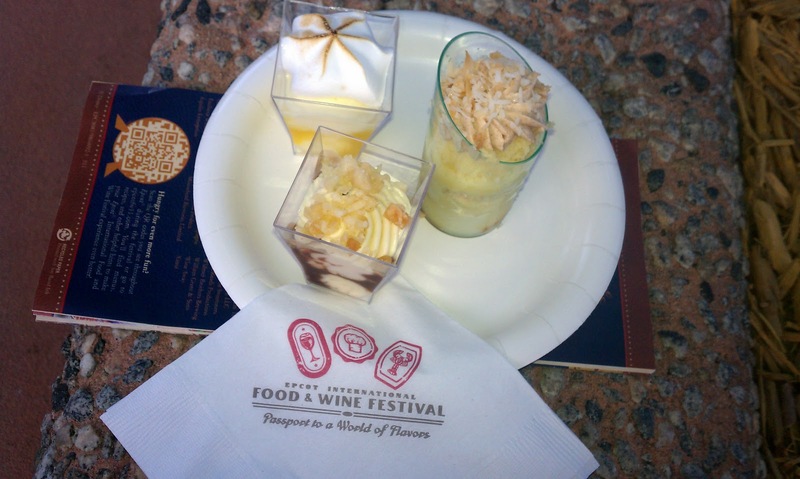 A dessert trio, from the “desserts and champagne” station – which consisted of a sampling of Lemon Chiffon, White Chocolate Macadamia Mousse with Dark Chocolate Pearls, and a Tres Leches verrine. Needless to say it was well worth it and unbelievably good! A lady who was in front of us in line ordered the “Vanilla ice cream with Grand Marnier” and said it was “like an adult ice cream float”. It certainly looked good! Maybe I’ll try that one next time. If you were going for dinner, you would probably want to plan on getting another plate or two, and maybe even another drink, which would end up putting you closer to the $30 per person range. I had a great time! 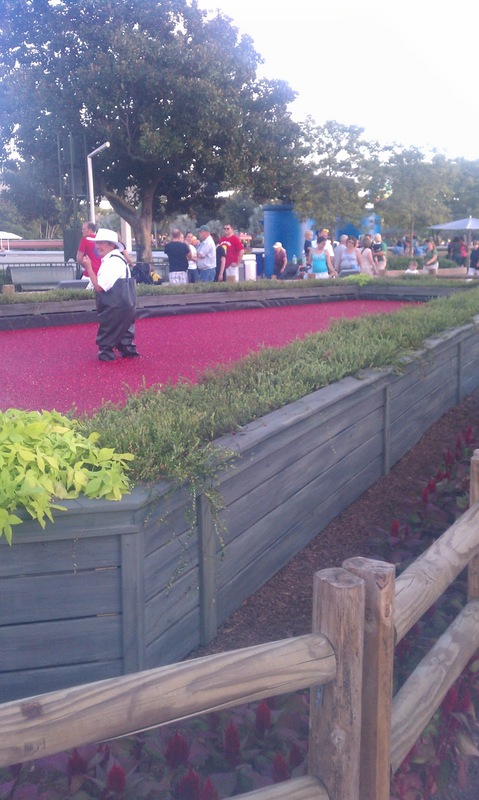 I just HAD to take a picture of the Oceanspray Cranberry lady, she was all by herself in the big cranberry display, but she was talking to everyone who came by! A fellow Pinterest Fan suggested heading all the way to the BACK of the park if you are there when it opens, to avoid some of the immediate lines where the World Showcase starts. That is a good tid-bit of information if any of you are planning of making a day of it! Another excellent resource I found through Pinterest said that you can actually use some of the foods at the different countries as snacks from your Disney Dining Plan! That’s always good to know, especially when there are so many options to choose from! I’ll update you as I continue to go! I know next weekend I’ll be back with more friends, and I would assume another time or so after that until the festival ends. I can’t wait! If you have any pictures or tips you want me to share with everything, send them to me and I’ll add it to the list! We were able to use snack credits on ALL nonalcoholic items! It was awesome and so much better than popcorn!